Tissot was founded in 1853 and for over 155 years has had its home in the Swiss watch making town of Le Locle. Tissot make high tech products using special materials and with advanced functions. With a broader, more versatile range of high quality affordable time pieces than any other Swiss watch maker, their aim is to make excellence accessible. Tissot are the official timers fo Moto GP and World Cycling championships. From the clever T Touch to the practical PR100, the range has something to suit all. A selection from the Tissot range is available in our Online Shop with a further selection in our stores in Crewe and Newcastle. 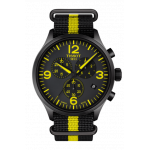 If you cant see the specific model of Tissot watch please contact us and we will be happy to find it for you.